This is how summer makes us feel! 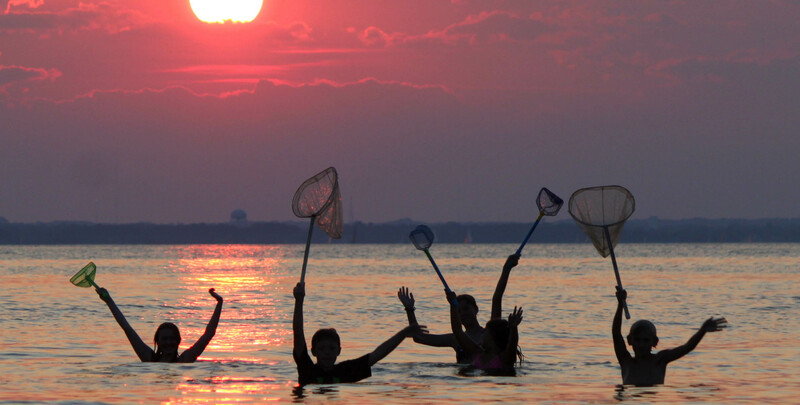 Another summer sunset is reason to rejoice for these Bay-loving kids. Becoming a kid again. Every summer, hundreds of teachers, principals, and administrators get to experience exactly what their students experience when they join CBF on a field experience. Not only do these lucky ducks get to see the wonders of the water first-hand, they even earn credit while doing so through our professional learning program Chesapeake Classrooms. Picking up trash! That’s right. Who knew picking up plastic bottles and cigarette butts could be so fun and rewarding. But indeed it is—just ask the more than 146,000 volunteers from across Virginia who have participated in Clean the Bay Day over the past 29 years. All in all, these dedicated folks have removed approximately 6.4 million pounds of debris with us from nearly 6,900 miles of shoreline! Come join us the first Saturday in June! Sharing Bay Selfies. Call it vanity, call it confidence, call it your love for the Bay . . . we want to see your #BaySelfie! Send us a selfie next time you're out enjoying these final summer days on the Bay and its rivers. “Partying with a purpose.” Now in its 11th year, our annual Bands in the Sand event brings together amazing food, drink, friends, and live music at water’s edge here at our headquarters in Annapolis. Don’t miss THE party of the year. Make Jimmy Buffett proud. Tickets go on sale May 9. Channeling Otis Redding. On one of those blue, dreamy summertime days, we highly suggest you do the following: Find a dock on the Bay (or a cool bank along a river). Sit down, lean back, breathe in, stare out. So get excited—just 48 days and counting . . .